Pretend you live in Europe and what you want in your next car is something a bit different than the usual European offerings. Something a bit more raw and fun, American and houses a V8 engine. You could import a vehicle, but what if something was available which ticked all the boxes already on your shores? The Mustangs is available in Europe with the steering wheel on the wrong side or right side depending on how you look at it, which means Europeans can enjoy V8 fun without feeling like they are sitting in the gutter. However, if you want the pick of the bunch, both old and new, you eventually realise that you will need to get used to the wheel being on the other side. It’s a shame that there are no Mopars in right hand drive, but you have to select the options your given. 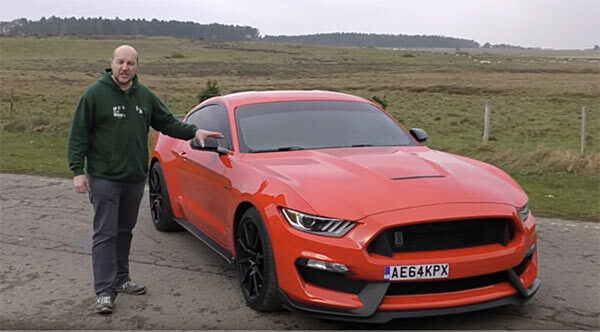 The Mustang GT350 reviewed in this video is on the default side and gives you a good impression on how a Brit. views the GT350 on native roads. Although the Mustang is commonplace in the US, it’s more of an exotic rarity in the UK. It’s a bit like meeting your cousin from across the water you have not seen in years. There are very familiar, but they have little quirks and oddities which stand out from the norm. Suffice to say, in the middle of a country filled with four cylinder cars, the Mustangs stands out proudly and there’s nothing better than being a bit of an exception to the norm. Next Story → Commuting in a 840hp Dodge Demon. Can It Be Done?